Have you been in a car accident and have pain that runs down your arms or legs? The medical term for this pain is called Radicular pain meaning radiating pain. Radicular pain radiating from the neck typically radiates down into one or both arms. Likewise radicular pain from the low back radiates down one or both legs. This Radicular pain is produced by irritation or pressure of your spinal nerves. This causes you to experience pain and may be perceived as tingling, or numbness in other areas of your body which is distant from the real source of your problem. When you have been involved in a car wreck odds are you will suffered traumatic insult to your spine and may have suffered spinal ligament injury and when this occurs there are a number of scenarios that can affect the nerves that exit from your spine. Vehicular collisions produce ultra-fast traumatic forces causing stretch type damage to the ligaments and muscular tissues which then causes irritation of the nerve root. This nerve root irritation typically affects the function of the part of or the entire length of the nerve. If you further suffer a ligament damage and/ or spinal disc injury, this may cause the disc to protrude or herniate which in turn causes spinal dysfunction and compresses and irritation of your nerves. If you had any underlying arthritis and have been in a car accident your body naturally tries to fortify the spinal joints by laying down scar tissue which will then begin to calcify, which can lead to spinal stenosis. Spinal Stenosis causes a constriction or choking off of the spinal nerves. 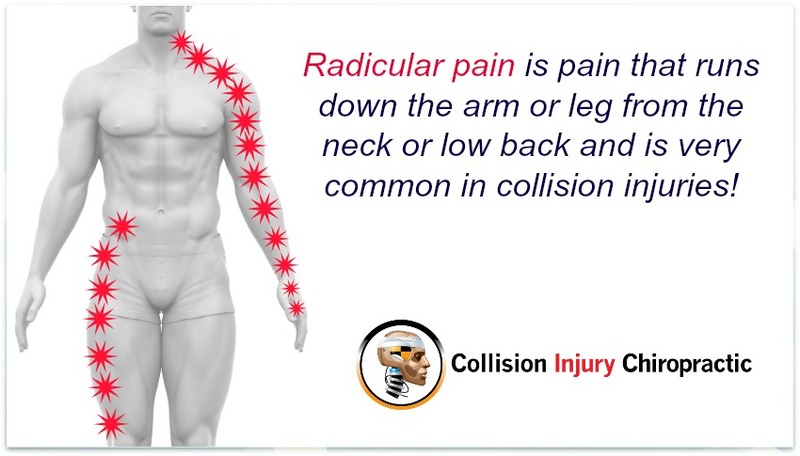 The Chiropractors and Medical doctors of Collision Injury Chiropractic will perform a specific examination for those who are experiencing radiating pain and locate the exact root cause of the compression and then provide care that will decrease the compression on the nerves involved. 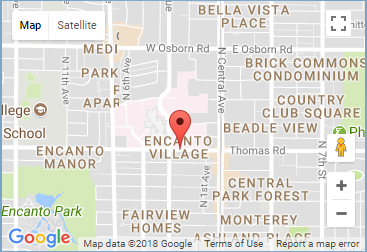 If you’ve been in a car crash and have symptoms of radicular pain we are here to help. We can help pinpoint the root source of your pain and develop a treatment plan to help you restore your health. Call Us today at (602) 456-7252 for an appointment or for more advice.